You know exactly when you’ve run into a non-American superhero when you encounter the cliché about their national identity. And yet, I’ll take them over their present incarnation as the space equivalent of the border patrol, which in 2019 is, ah, not a good look. You don’t really know what you’ve got until it’s gone. That’s right, this is about a shrinking guy! I love those heroes, my misgivings about the microverse aside. Always fun to write about and draw; all you have to do is look around your office and you have an obstacle course. 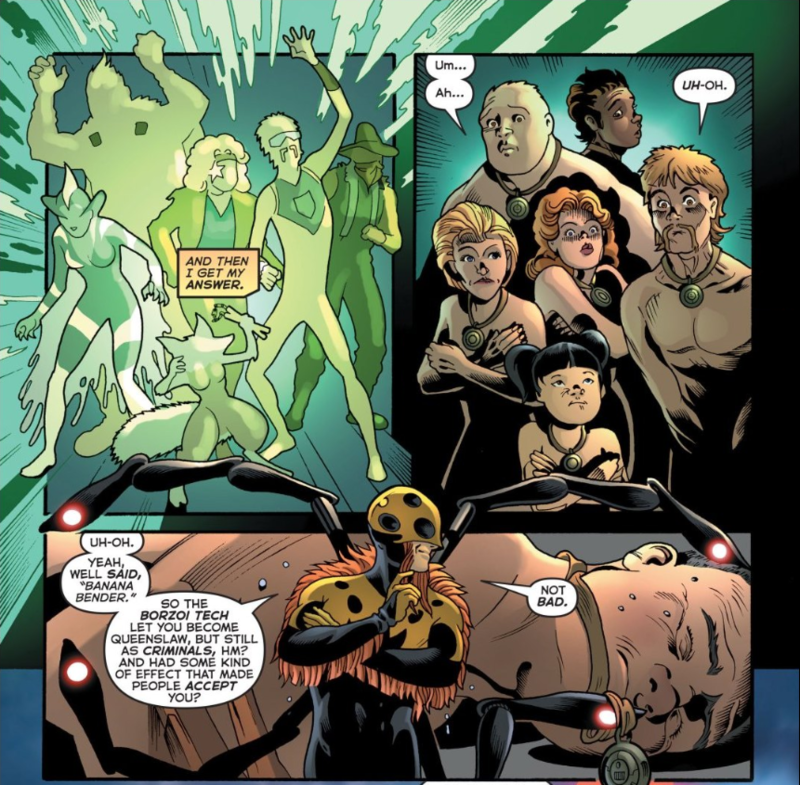 This shrinking guy is the Australian superhero Wolfspider, named after one of the ten thousand things in Australia that will kill you stone dead if it so much as thinks about you too long. 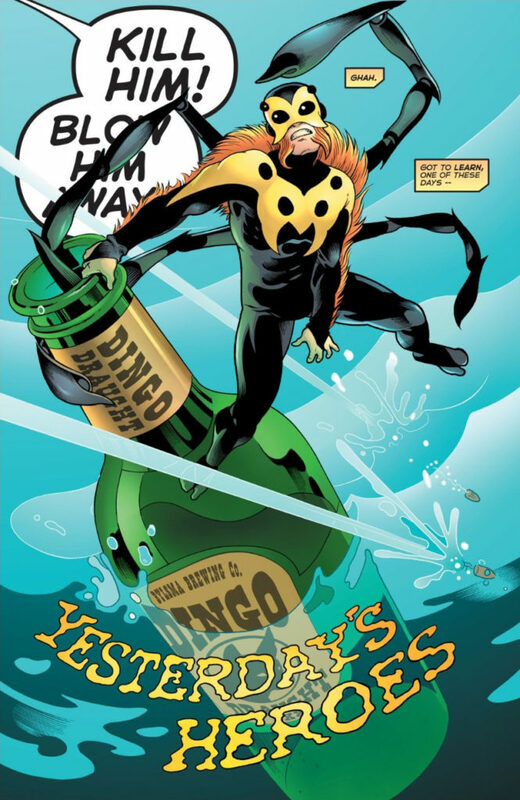 As superhero concepts go, it’s pretty good; an experimental antivenom makes him tiny and alters his nervous system and he grows up inside his mother’s lab, with the help of a tiny flying car and four mechanical limbs. This makes him Doctor Octopus, Spider-Man, Ant-Man and Impulse all at once, proving that sometimes the Blender Approach to making a superhero is the right one. 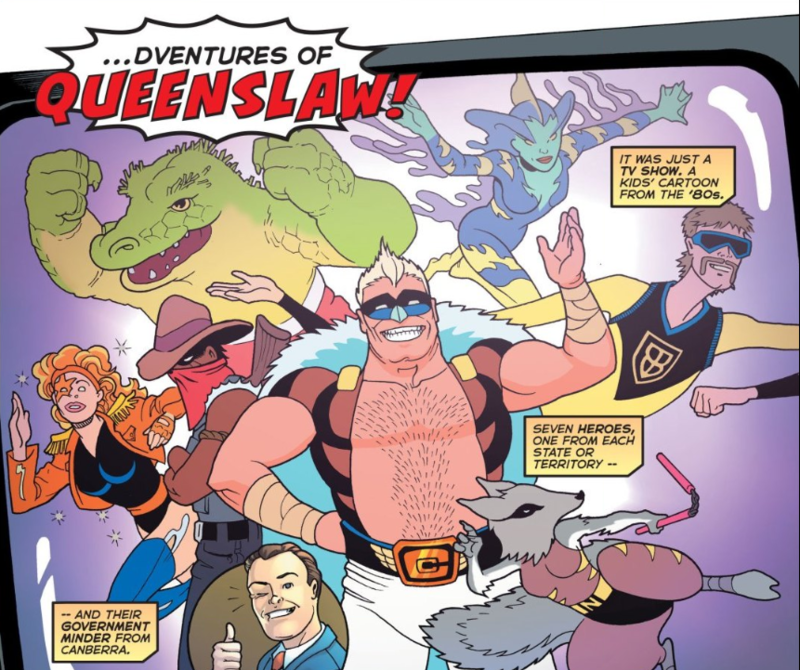 Queenslaw is great, because they’re the answer to the question: what does a superhero cartoon full of stock stereotypes look like in a world where stock stereotypes are the order of the day, there to be fleshed out and humanized? It looks like the random anime segment from Kill Bill, a hyperreal aside in a hyperreal movie; it looks like how a superhero cartoon looks at age 29 instead of how it does at age 9. … except suddenly they are real, and Wolfspider does the most understandable thing in the world: he goes and meets them. I can’t fault him, because if I had an opportunity to meet Optimus Prime, there would be a Charlotte-shaped hole in the wall and a distinct lack of me in the room. 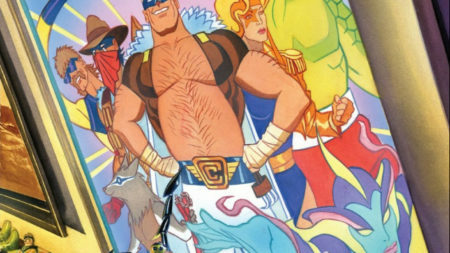 Wolfspider meets up with his heroes, and helps them out – or appears to, because there’s something not quite right with Queenslaw (besides the marsupial with ninja weapons, that’s perfectly normal.) Eventually they turn on him, he escapes, and then he’s confronted with: A Deep Continuity Cut. 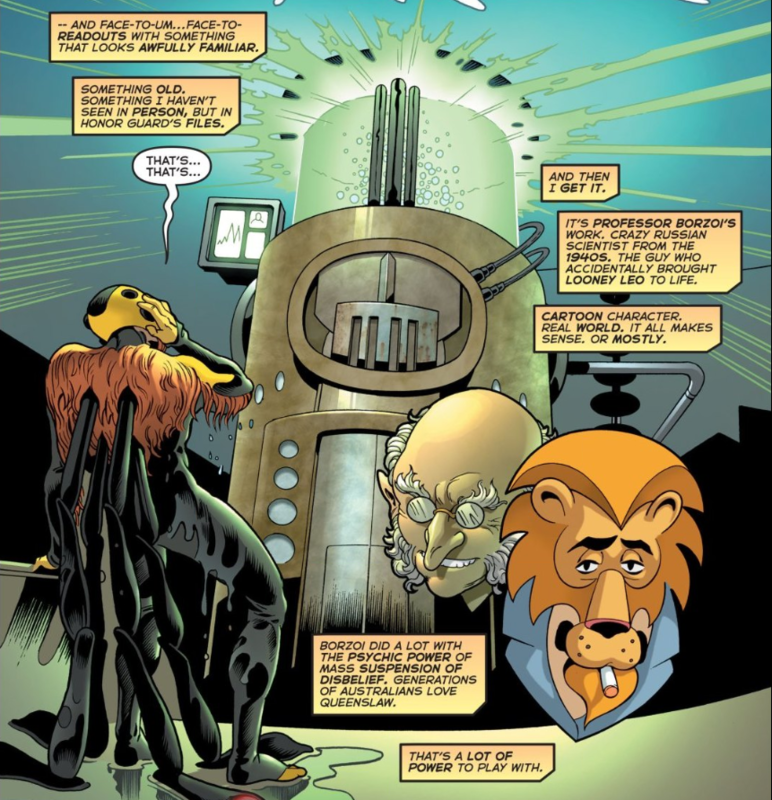 Yes, it’s the device that brought Looney Leo to life – the star of one of Astro City’s early stories, a cartoon lion brought to life. 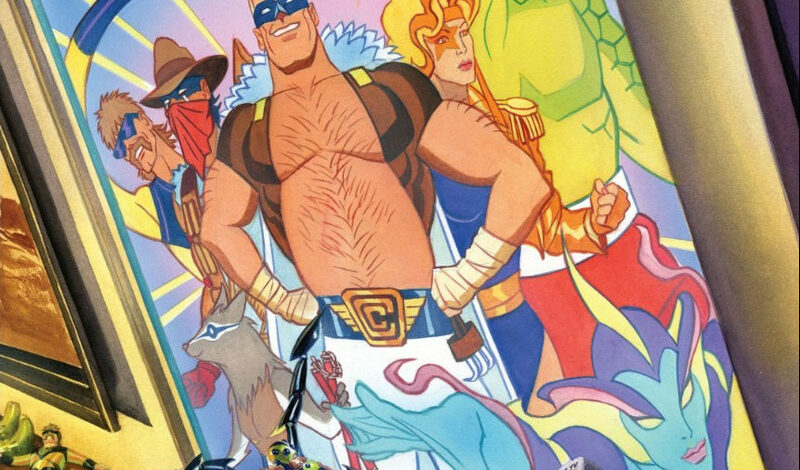 That selfsame issue also makes reference to Starfighter’s kid sidekick, which is the sort of stuff that really makes Astro City work for me. It’s a small crew, working on their own project, but it feels like a full-on superhero universe in all the best ways. Stuff comes back and stories pay off. This particular device is essentially weaponized nostalgia, drawing on everyone’s love of Queenslaw and using it to make them real, then grafting that reality onto criminals ready to exploit it for their own ends. As metaphors for the ensnaring power of nostalgia go, it’s not quite as blunt as an ornate crystal mechanism that’s destroyed when it’s hit with Nostalgia, but it’s pretty obvious. 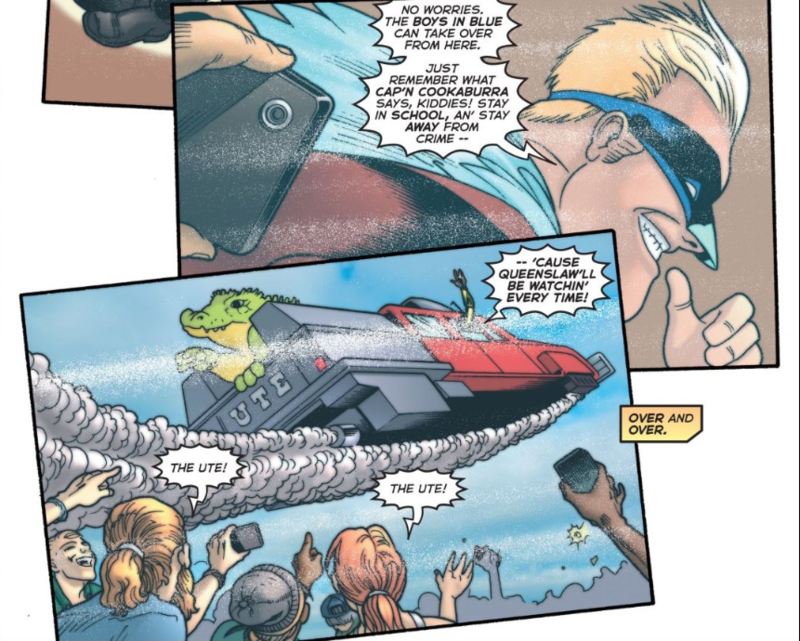 Nostalgia for formative is a human emotion, and one that Astro City’s played with in the past; in the aforementioned Looney Leo story, he’s pulled back into showbiz by the nostalgia cycle. Most of superhero comics is built around this cycle. Remember Spider-Man? Sure you do. You might not remember this version of Spider-Man, but you remember a version, and they’ll be happy to take your money regardless. Astro City’s been around long enough that nostalgia can hit it, too; this whole series is about its nature as a revived property. 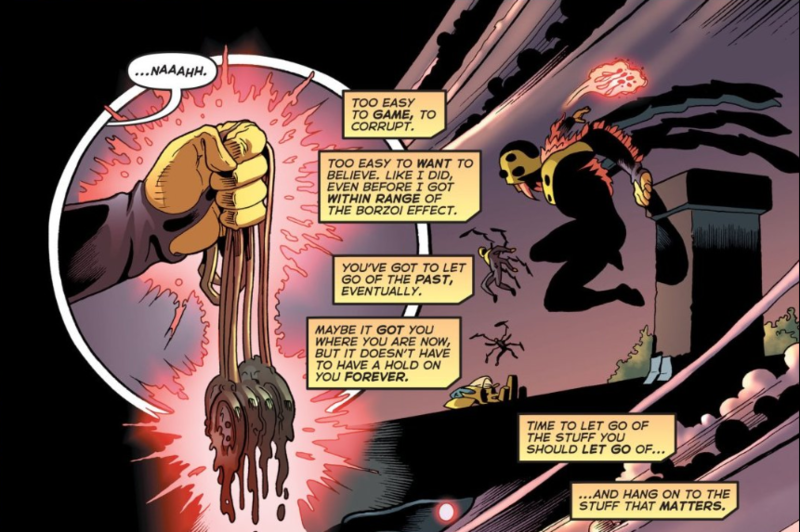 And even beyond that, it trades – trading well, mind you, but still trading – on the nostalgia of other superhero comics and how different eras of comic books “feel.” And so, this story in particular is interesting, because of its protagonist – an entirely new character, made up for this revival. Wolfspider isn’t the second Wolfspider, a new take on an old character – he’s a new character, and so what he has to say on the subject rings authentic. He decides, in the end, to resist nostalgia’s siren sway – even if he picked good people to become Queenslaw, the effect the process has on how they’re perceived would lend a fundamental dishonesty to the whole affair. Instead, he jets off in his tiny flying car to go buy dinner for his mom – as a true superhero would do, even an Australian one. Next up: what happens when you’re on the other side of an alien invasion, and the aliens are from Earth?